My apologies, I queued up four different reviews... and then blew my Saturday cleaning up the compact fluorescent light bulb I dropped in the living room... oh what a pain. Ok, here we go. Oh I feel like such a heel, this review has literally been in my head for 3 months. Ohhh, at this point it's more of a mention than I review, but let's get it out there. 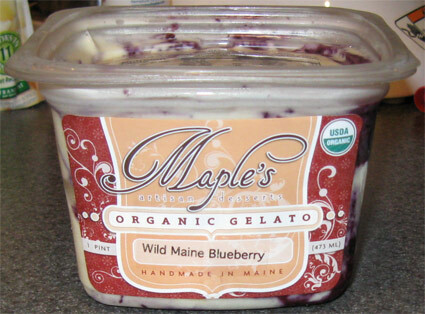 Our local Whole Foods carries Maple's Organic Gelato and it's hard to resist due to some unique clear packaging. That's right, Maple's made the switch to PET and the owner wrote an excellent blog post about it. I highly suggest you take the time to read it, it's really interesting. Once you are done reading that, head on over to their flavor listing (which needs more pictures!!). Anyway, I have had this and it's respectable, what else can I say (i.e. remember). I think it struck me as fairly light, especially considering it is in fact a gelato, but at the same time I think it had a fairly milky vibe to it. I think I remember the blueberries being fairly mild too. 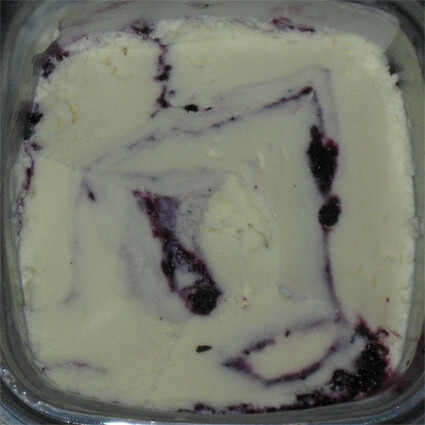 See, it's not BLUEBERRY flavor, it's blueberry flavor. Yeah, it's hard being descriptive after 3 months. To be honest I had actually wanted to start with the raspberries & cream flavor, but all of those pints were covered in ice crystals. At some point I will head back and grab another pint, maybe do a little live blogging to make up for this forgotten product. Ok, I'll be back tomorrow with something a bit more recent. I'm intrigued by this brand. Looking at the nutritionals, they're really good especially for a gelato. I sent them an email seeing if they're carried anywhere around me. I want to try the caramelized banana flavor.